Starting with PhotoRealistic RenderMan 3.7, it is possible to sample lights from within a volume shader. This allows volume effects such as atmospheric haze, smoke, atmospheric shadows, etc. 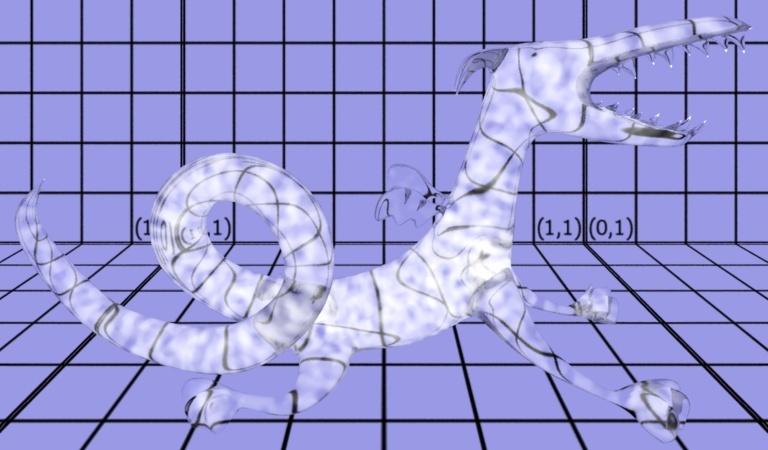 This Applications Note explains the general strategy for writing shaders to produce these effects, and lists a sample shader which implements a smoky appearance. It has been updated with examples for creating these effects via ray-traced or visible point shading. * adjust Ci/Oi to add new light and extinguish due to smoke opacity. Volume shaders of this type can be very expensive. The computational expense is proportional to the number of iterations of the while loop, which is determined by the step size and the length of I. Therefore, it is important to choose your stepsize carefully - too large a stepsize will result in banding and quantization artifacts, while too small a stepsize results in very long render times. You will probably need to carefully tune the stepsize on a scene-by-scene basis. Also remember that atmosphere shaders bind to surfaces, just like surface or displacement shaders. So you must have an object in the background for the atmosphere shader to run. In other words, pixels with no geometry at all "behind" them will not run any atmosphere shaders. 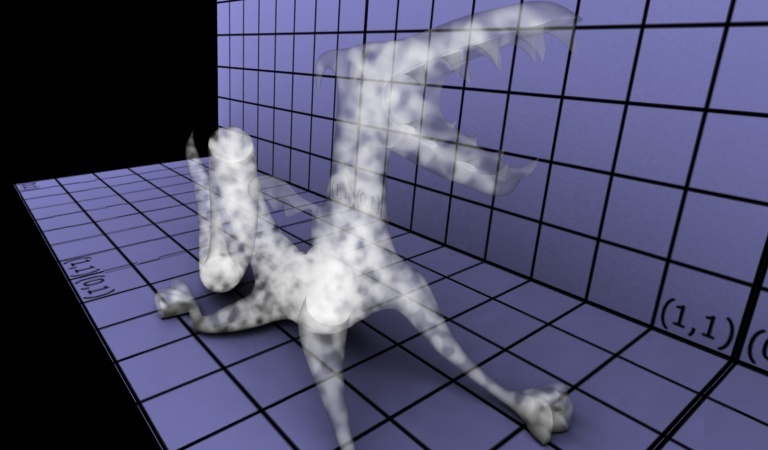 Below is a shader that implements such a ray marching algorithm to simulate smoke. If the light sources in the scene cast shadows, you should be able to see the shadows in the smoke. *    used to integrate to find scattering and extinction. *          integration of atmospheric effects. *          of this shader is inversely proportional to the stepsize. *   debug - if nonzero, copious output will be sent to stderr. * of the portion of the volume covered by this step. The image below was produced with this very shader. 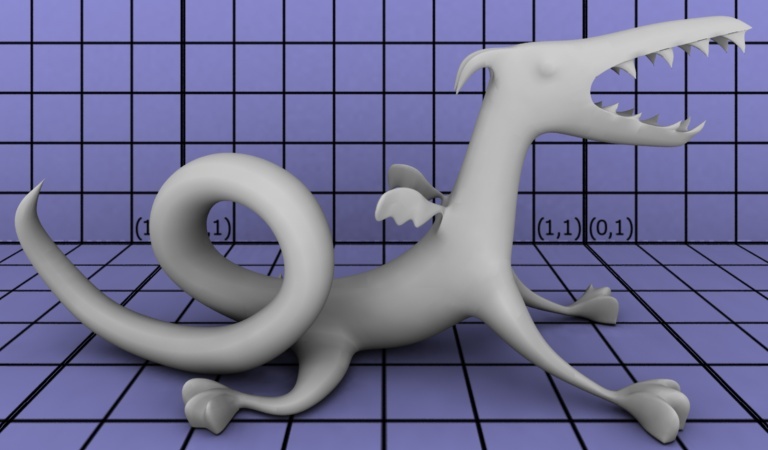 One particular problem with volume shaders can be the appearance of motion "dragging" when using motion blur on objects in scenes with volume or atmosphere shaders. Here's that dragon again. This time "Opacity .4 .4 .4" is applied to it, and it is using the default surface shader. 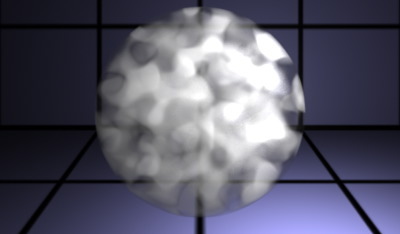 Note that this surface shader makes no ray tracing calls. 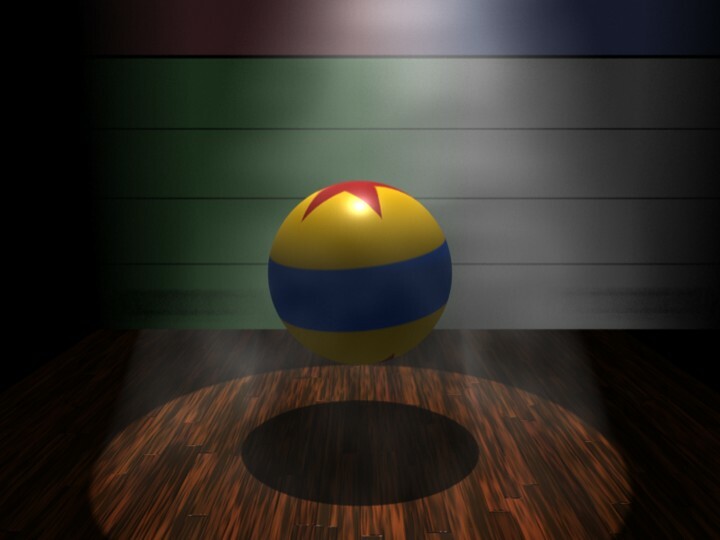 Getting interior volumetric effects on an arbitrary object like this used to require the surface shader on the "front" to find the "back" analytically, as described in the first smoke example above, or by tracing rays, as described in the second. 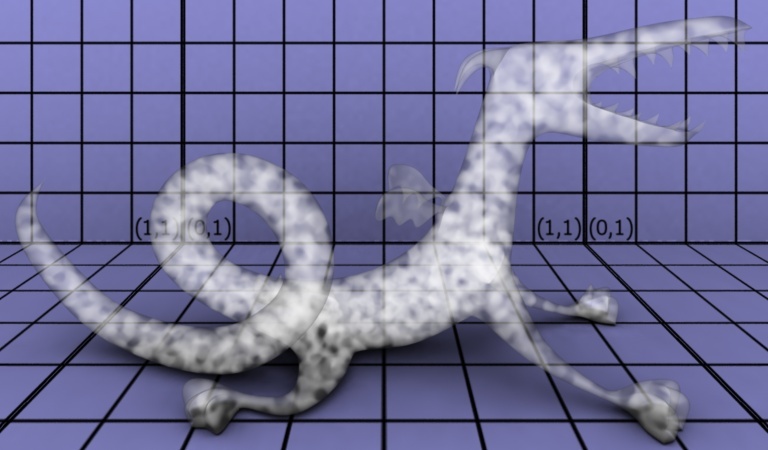 In this second image, only an additional "smoke" VPInterior shader has been attached to the dragon, the surface shader is still "defaultsurface". 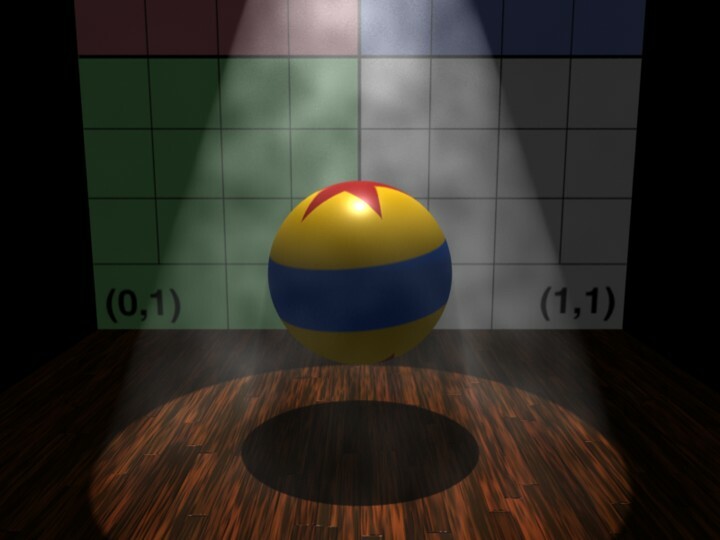 Visible point shading delays volume shader execution on this object until all of the z-samples (front and back "visible points") are known. Visible point shaders are automatically executed, without requiring changes to the surface shader (like Atmospheres). These volumes are computed in 3D, like atmospheres. 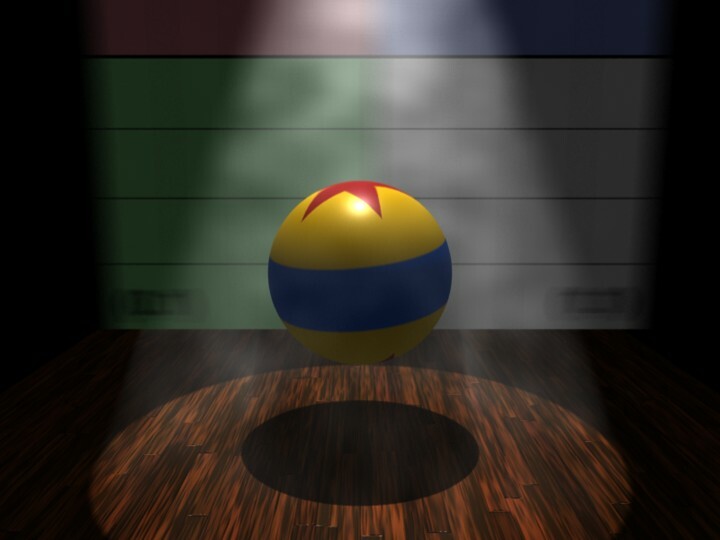 All volume shaders operate on an interval, along the vector "I", starting at the surface near the camera "(P - I)" and ending at the next surface "P". When there are several VPInterior shaders attached to different objects, the one associated with the interval origin is used by default. 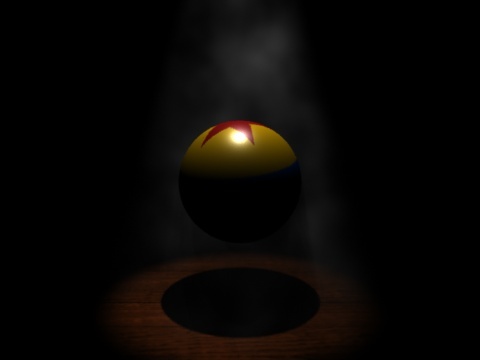 Here's a complete, simplistic example of a smoke-filled sphere using the same technique. The smoke shader is the one used in the example above. Just as with a typical Atmosphere shader, the smoke shader will march along the "I" vector towards a surface point "P" selected by the renderer. 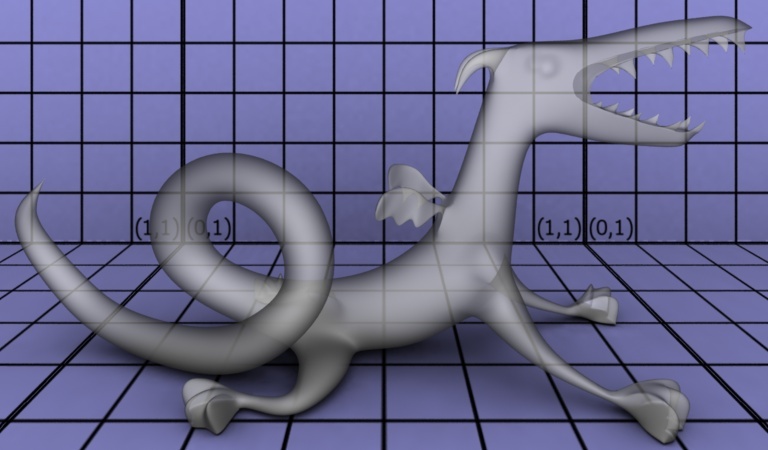 The volume shader modifies the existing Ci and Oi, already computed by the surface shader at P, according to its volume function. 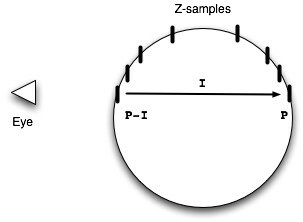 The difference here is that the incident vector I does not start at the eye as it would for an Atmosphere, instead it begins with the frontmost z-sample of the object and ends at the rear z-sample. The object must be partially transparent (or have culling otherwise disabled) in order for both the front and back samples to be present in the "visible point list."